Put form, interest and playability virtually anywhere with the simple, iconic, irresistible PlayCube 1.0. Based on the groundbreaking design of prominent architect/designer Richard Dattner, PlayCubes offer rich physical, social and cognitive play value – with refreshingly fun ways to engage. This distinctive geometric shape invites interpretation, imagination and exploration – along with climbing in, on and through – for a totally unique, immersive play experience. Whether a space ship, a seed pod, or a mini-clubhouse, PlayCube 1.0 turns the smallest spaces into opportunities to imagine, climb, meet, hide, or relax. 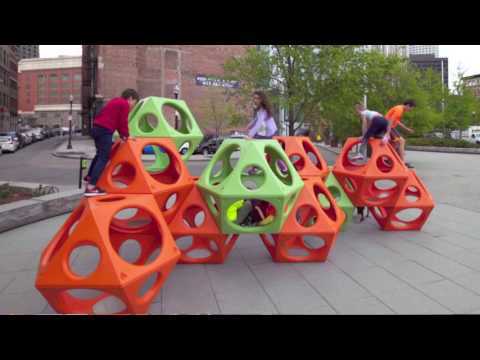 Refresh an existing playground or add new sculptural play in unexpected places … one PlayCube at a time!